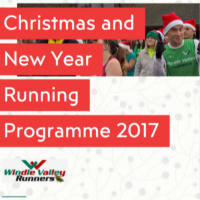 Where did that month go, here is your February fix of Windle Valley News.. 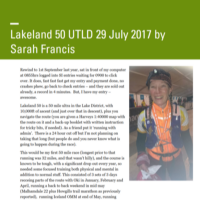 While the snow is outside, its the perfect time to put your feet up and read this months newsletter, see what one member has planned for the year and read all about lakes in a day. 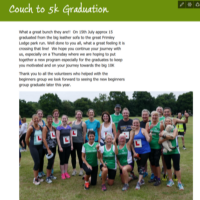 The Chairman's/Coaches corner is back and a new year start for the club 10k League..
January 2019, New Year New Challenge.. Just when you think it should be a quiet month with all the Christmas celebrations, still lots going on with the Windle runners, read on for a marathon report, a medal a month, 365 RED celebrations and lots more.. Click here to read all about it..
~ the return of the Cross Country season - will we make a good defence of our first ever league championship? Highlight of the September edition was an interview with new Coaching Coordinator, Mike Goodwin. We learned about the best advice he's ever received, the running achievements of which he's proudest, and also that he has run 800m in under 2 minutes! 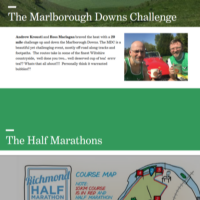 There were race reports from August including from the Wimbledon Half, the final Yateley 10K of the 2018 series, Dinton Pastures and the Brutal race series. The July newsletter was full of stories of great derring-do! Hills seemed to have been the order of the month too, including the race called "The Hurt", the Hampshire Hoppit Marathon, a hill race at the Hogs Back, and many more besides. And in the shorter stuff, Dawn was also Ladies' Winner in her hometown Bracknell Half Marathon - quite a month! Elsewhere, one of our newest runners revealed her innermost thoughts about running, and chief coach Mike Brock revealed why he was running for Sandhurst Joggers (? !^*&%) during May. As is usually the case, May was all about the April marathons. A scorching hot London saw some struggles and some great performances. Our Brighton runners fared better. Captain Dawn sent in a race report from the day, and Joanne told us about how she progressed from Couch-to-5K to completing 26.2 miles. The chilly pictorial theme of recent newsletters continued as March opened up on a distinctly cold note. And Sarah and Oki were once again our cover stars, 12 months after their last appearance. Inside, the content was a lot warmer, as we celebrated winning the Thames Valley Cross Country League for the first time. The main feature was the report from our annual awards dinner, celebrating our 2017 champions and award winners. Coach Mike was musing about old age and deciding it's not all bad. Race reports included Wokingham and Bramley - in the latter our ladies won the team prize. Once more, our cross-country team's successes were our main news, as we stayed top of the league going into the new year. December had seen lots of achievements in other areas too, including a new Club Record at parkrun! There was so much to celebrate in the October issue. Plus, could be the start of something big - the Windle Valley Agony Aunt column! Read on for all the news from an exciting April, which saw great performances at every distance from parkrun to Marathon to (blimey) 100 miles! This included new club records for both the ladies' and men's marathon times by Dawn Godwin and Phil Young! Plus, we had a report from the Chicago Marathon - from 50 years ago! Plus lots more, as ever! We started this newsletter with a video of them blowing up our local motorway bridge, which never gets old!